Lad is a very well bred ABCA registered tri color male. He has over 5 champions in his pedigree! Including ,the awesome WORKING bloodlines from Alasdiar Macrea's *##Imp. Nan ABC 77943, @@Imp. Dale ABC 50469, ## IMP. Craig ABC 142668, ##Spot ISDS 161819, ##Zac ISDS 66166, #Mirk ISDS 96612, and many open trial winners in his pedigree. His grandmother, *##Imp. 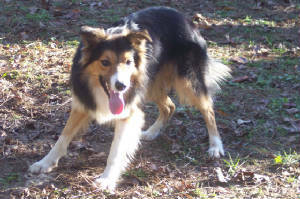 Nan, was a International Supreme Champion in Great Britain before coming to America to dominate the United States trial circuit winning the Purina Field Trial Herding Award in 1997 and the National Finals in 1997, 1998, 1999. Lad herding with great intensity! Is Lad available for stud? Lad is available for stud to approved females only. He throws some pretty fantastic pups, with excellent working ability and just awesome temperaments. So he is definitely the dog to breed to if you want outsanding working ability, affectionate, good all-around dogs. Lad is the only male in the south east with this breeding. It is extremely well sought after and mixed with the right working lines produces FANTASTIC versatile dogs. 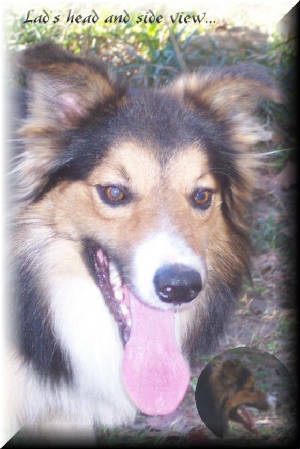 He has offspring all over the country successfully competing in herding trials, agility, and many more just family members! Thank you for taking the time to view our site! Copyright © 2004 Andrew Tuck. All Rights Reserved. Tuck Everlasting Farms, All rights reserved. No one, for any reason, is permitted to copy the photos, graphics or text on these pages without written permission from TEF. In the event that an infringement is discovered you will be notified and invoiced the industry standard TRIPLE FEE for unauthorized usage and/or prosecuted for Copyright Infringement in U.S. Federal Court where you will be subject to pay our court costs and attorneys' fees as well as a fine of US$150,000 statutory damages.